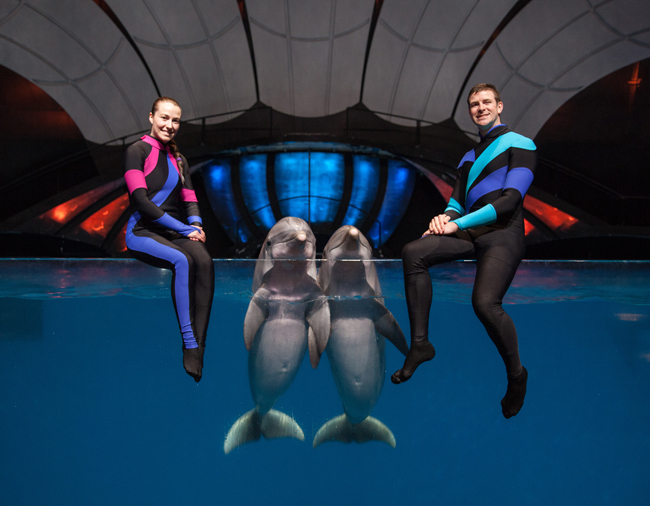 wanderlust ATLANTA: Sea Lions, Dolphins, Penguins and So Much More! Part of its year-long 10th anniversary celebration, Georgia Aquarium is debuting new and re-mastered experiences for its next 22,000,000 visitors! 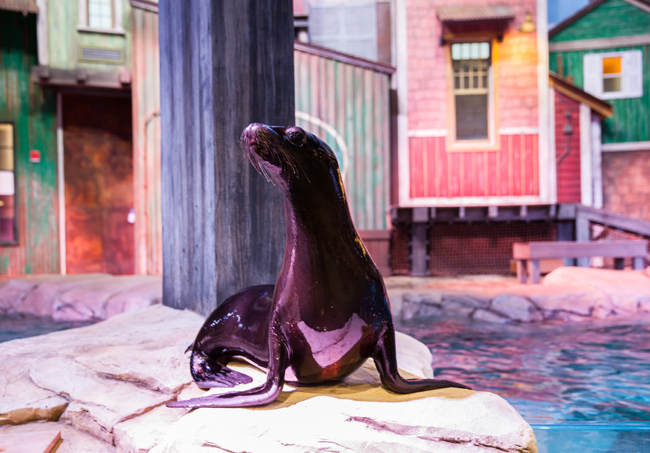 Opening to the public tomorrow, March 31, 2016, is the brand new California Sea Lion Experience in SunTrust Pier 225 and a wholly new dolphin show titled AT&T Dolphin Celebration. 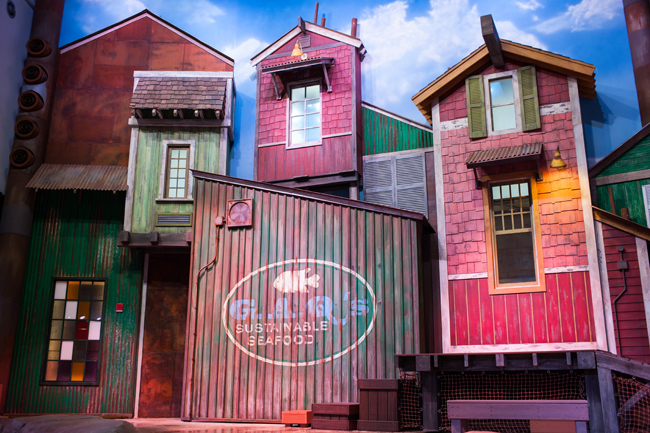 They've also renovated their 4D Funbelievable Theater, now featuring a "Happy Feet" short; they've added new touch pools AND keep an eye out for their new penguin "waddle" experience! 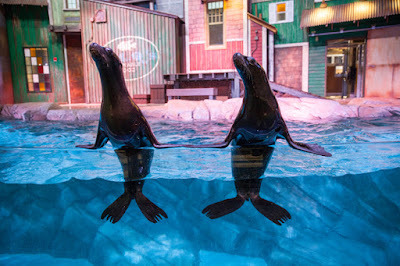 California sea lions are the newest members of the Georgia Aquarium family, and every one of them is a rescue! 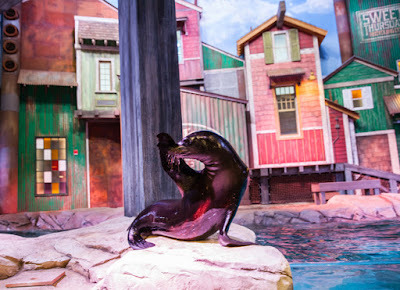 The new sea lion experience in SunTrust Pier 225 is educational and playful with a generous splash of fun! The adorable sea lions, one of them weighing in at 500 pounds!, and their dedicated trainers will be teaching guests about sea lions and how the Aquarium is caring for them, all during a live training session! Being the space geek that I am, you can imagine how delighted I was to learn that two of the smaller, younger sea lions are named Neptune and Jupiter! Yes, yes, I know Neptune was the Roman god of the sea, but my ears heard planet and planet. Either way, they're both so adorable! 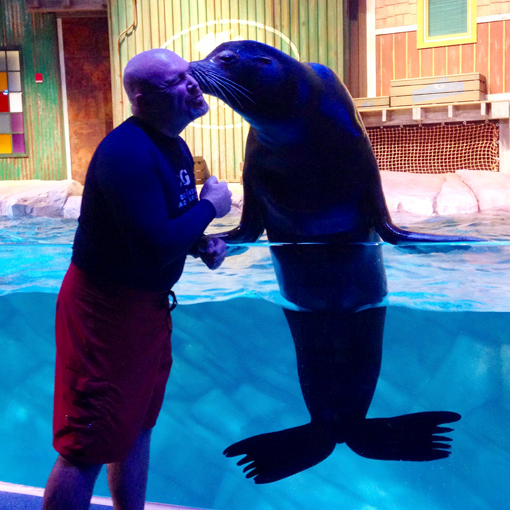 When I attended the media preview event, we saw five sea lions! In 2010, I saw the famous PIER 39 sea lions in San Francisco, California, and immediately fell in love with the pinnipeds. I am personally absolutely excited to see the research and conservation efforts being made by Georgia Aquarium for these lovable creatures. And the new show is awesome! More than 22 million guests, including students, tourists and celebrities (such as Jennifer Lawrence, Betty White and Usher, to name a few), have visited Georgia Aquarium since it opened in 2005! Each minute, the Aquarium's life support system filters more than 170,000 gallons of water! Guests from all 50 states and 143 countries on six continents have visited Georgia Aquarium! Georgia Aquarium is one of the world's largest aquariums, with more than 10 million gallons of water in more than 100 habitats and is one of the most abundant collections of aquatic life anywhere! Georgia Aquarium is the only aquarium in North America that is home to manta rays and whale sharks, the largest fish in the world! 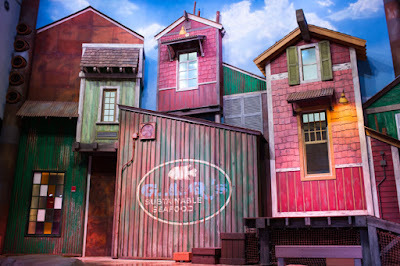 I'm a little embarrassed to admit that in all the years I've been visiting Georgia Aquarium I'd never been to their 4D Funbelievable Theater. On the evening of the Media Preview, I made a point to go. It's totally awesome! The film is 3D, there's some slight motion in your chairs, there's wind, there's snow, there's bubbles (simulating being underwater), there are leg ticklers...it's a very cool experience. The current movie being featured is a short of Happy Feet, which I'd never seen, but thoroughly enjoyed! I enjoyed it so much, in fact, that the next day I went out and purchased the movie so I could watch all 108 minutes of it. I especially enjoyed, in the special features, Savion Glover encouraging people to find their own heartsong, to artistically express themselves in whatever way brings them joy. The above photo is the only one in this post that I made myself. The others are courtesy of Georgia Aquarium. On the evening of the Media Preview, the reason I got this awesome shot is that I sat in the Splash Zone, in one of the front rows. Most everyone was sitting in the farther back rows, but I wanted the full experience! It turned out to be the best seat in the house! I hardly got a sprinkle, but that could change show to show. I should mention that photography and video are expressly prohibited during the new show (we had special permission the night of the Media Preview). It's, of course, for the safety of the animals and trainers. 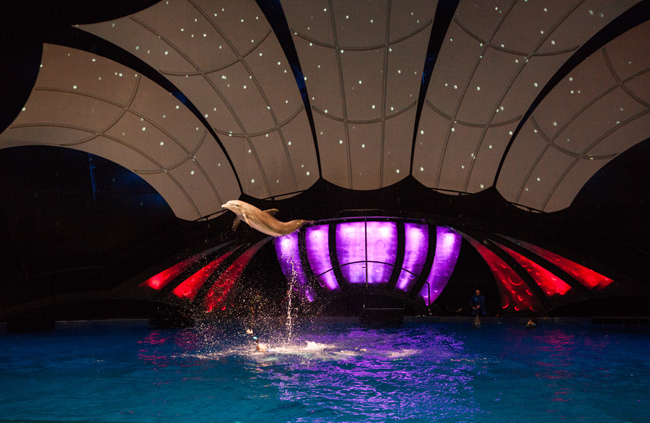 The wholly new dolphin show, AT&T Dolphin Celebration, is magnificent! 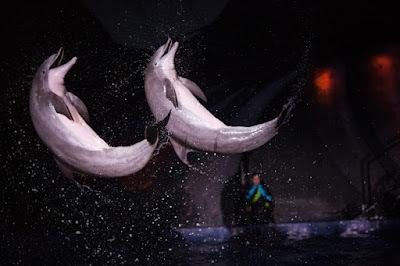 The previous show, awesome in its own right, was part fantasy and part dolphin entertainment. The new show is entertaining education and pure delightful dolphin entertainment, taken up quite a few notches! I mentioned the Splash Zone in the sea lion show...Dolphin Celebration has a SOAK ZONE, and when they say "SOAK", they mean SOAK! I didn't sit there that night, but one of the other guests did and she got SOAKED! Great fun! I was super excited to see my friend Sue, of Field Trips With Sue, that night. I got to hang out with her and her husband for part of the evening. Sue was one of the bloggers who inspired my writing of wanderlust ATLANTA when I started and I'm ever grateful to her for that. When you're planning your family vacation, do visit Field Trips With Sue for some awesome ideas! I immediately have lots of favorite moments in Dolphin Celebration, but I think my absolute favorite is the feat pictured above. What you don't see is that the dolphins are turning the trainer in a spiral motion...one of the coolest underwater things I've ever seen! If you've been to Georgia Aquarium before you know how wonderful the touch pools are. Now there are more and new ones! They're located throughout the galleries, so if you're not sure where to find them, ask any Aquarium employee or volunteer. I'd like to offer, and encourage you to as well, a huge "Thank you!" to Georgia Aquarium volunteers. 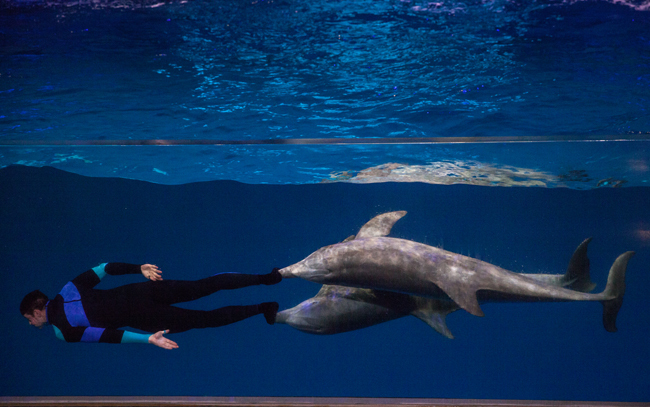 They serve 9,000 - 13,000 hours a month and have volunteered more than 1.6 million hours since the Aquarium opened. That's a lotta love! 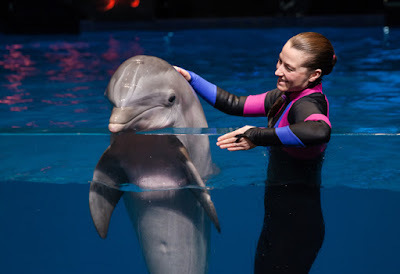 I have friends who work at the Aquarium and volunteer at the Aquarium, so I'm often regaled with fascinating stories of what goes on behind the scenes, which enhances my experience every time I visit. Georgia Aquarium's Veterans Immersion Program isn't new, but being former U.S. Navy myself, I'm compelled to mention and am grateful to the Aquarium for what they're doing for our brave men and women who have served our country. The program offers military personnel who have been physically, emotionally or mentally wounded, the opportunity to SCUBA dive or swim in the Ocean Voyager exhibit, complementing current rehabilitation and reintegration programs. The Aquarium also offers Military Mondays, complimentary admission on Mondays to active military personnel. Experiencing the five major galleries of Georgia Aquarium in an exhilarating and fantastical experience on its own. But if you want more, they offer some pretty incredible Animal Encounter and Animal Interaction experiences, including dolphins, penguins, whale sharks, otters and more! Happy 10th Anniversary, Georgia Aquarium! As you can see, there's a LOT going on at Georgia Aquarium, celebrating its year-long celebration of its 10th anniversary. Go see the new California sea lion experience at SunTrust Pier 225 and the wholly new Dolphin Celebration show and all of their other fantastic new and updated offerings!